I was browsing Tumblr when I saw an update from a Tumblr pal Ching Nicolas. 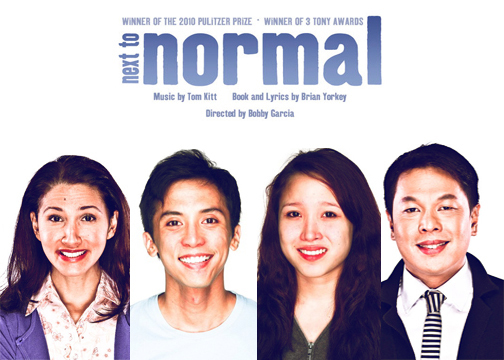 It seems that Atlantis Productions had already revealed the official main cast lineup for their first 2011 offering, Yorkey and Kitt's Next to Normal. Like what I revealed days ago, Next to Normal will be top billed by Menchu Lauchengco-Yulo who will play Diana Goodman, a mother who suffers bipolar disorder and Jet Pangan as her husban Dan Goodman. To complete the family tree, Menchu and Jet is joined by Bea Garcia (Spring Awakening, Xanadu) and Felix Rivera (Avenue Q, Xanadu) as the daughter and son, Natalie and Gabriel Goodman. 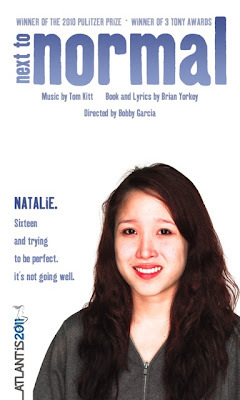 To be honest I'm not familiar with Next to Normal except the fact that it is a rock musical about bipolar disorder. But with this lineup, I'm pretty sure that this show will rock 2011. I just saw this! haha! 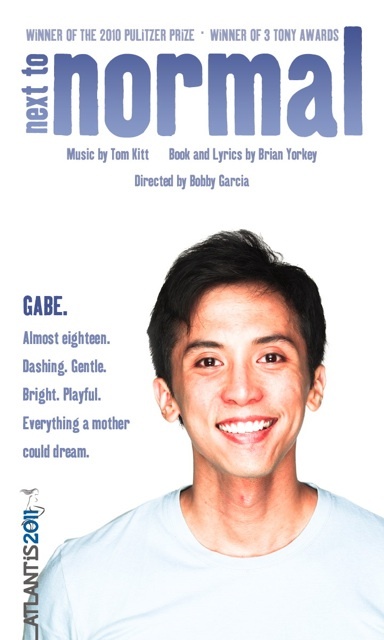 Watch the re-run of the Atlantis Productions' NEXT TO NORMAL on October 8, 2011 (8PM) at the Carlos P. Romulo Auditorium, RCBC Plaza. "Admit what you've lost, and live with the cost. At times it does hurt to be healed." on October 15, 2011 (Saturday), 2pm @ RCBC Plaza, Makati City. Tickets at P1500, P1300, P1100, P900 and P700.